In pursuance to the advertisement No. FCK 2/12/Appt/218/ 18 dated 10.08.2018 published in the official website of Kamrup(M), District Judiciary and the newspapers, namely, The Assam Tribune and The Niyomiya Barta, dated 11.08.2018, it is for information to the candidates, selected to appear for the Written Test for the post of Process Server in the establishment of Principal Judge, Family Court No-II, Kamrup(M), Guwahati, the list of whom is already published, in the official website of Kamrup(M) District Judiciary, i.e., www.kamrupjudiciary.gov.in, that the written test will be held on 24.02.2019 from 10:00 A.M. to 1:00 P.M. at B.M.B.B. Commerce college, KRB Road, Bharalumukh, Guwahati-09 and the individual call letters to the selected candidates are already sent by post. Test Date: 24.02.2019, from 10:00 A.M. to 1:00 P.M. 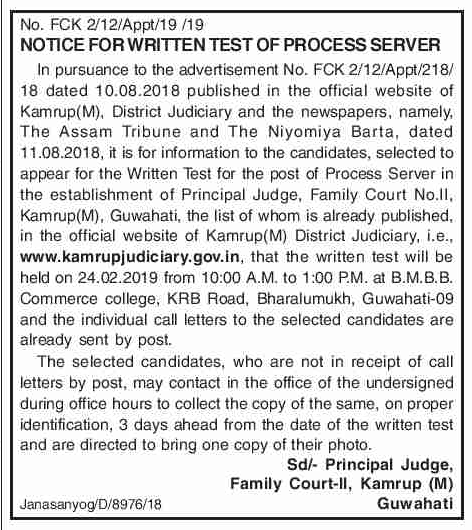 The selected candidates, who are not in receipt of call letters by post, may contact in the office of the Principal Judge, Family Court-II, Kamrup (M) during office hours to collect the copy of the same, on proper identification. 3 days ahead from the date of the written test and are directed to bring one copy of their photo.